In 1996, a young lady from London Ontario traveled to Haiti in search of a new beginning and the desire to help those that truly needed it. It wasn’t long before she stumbled upon an orphanage managed by an older American lady who was in desperate need for assistance in running the handicap home. Karen Bultje found her home - in the chaos of Port au Prince. One year later Karen made the move to her own facility - a three bedroom home rented by the month, to which she brought an army cot and a kitchen table. Karen then reached out to her family and friends back in Canada to help find support. 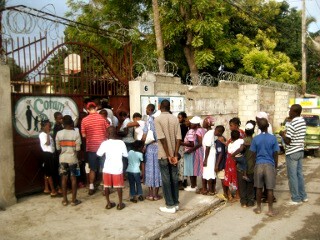 Today, Karen’s project, Coram Deo, is a fixture in the Delmas 31 community of Port au Prince. Following the earthquate she facilitated nearly 12,000 medical cases a year. The clinic now operates 2 days per week servicing about 5,000 medical cases per year. Karen operates an onsite school for 100 kids for all ages and capabilities - it is a unique learning environment! Coram Deo is also drop in center, a safe place, a study center, a home, an education center, a family. By donating today you are truly making a difference in the lives of the Delmas 31 community of Port au Prince. Mission of T.E.A.R.S is proud to have Coram Deo as one of their projects. To learn more about Mission of T.E.A.R.S., please visit their website here.